April 22, 2019 | How dumb is Duncan Hunter? Don’t ask. Scene from Escondido's Hidden Garden. 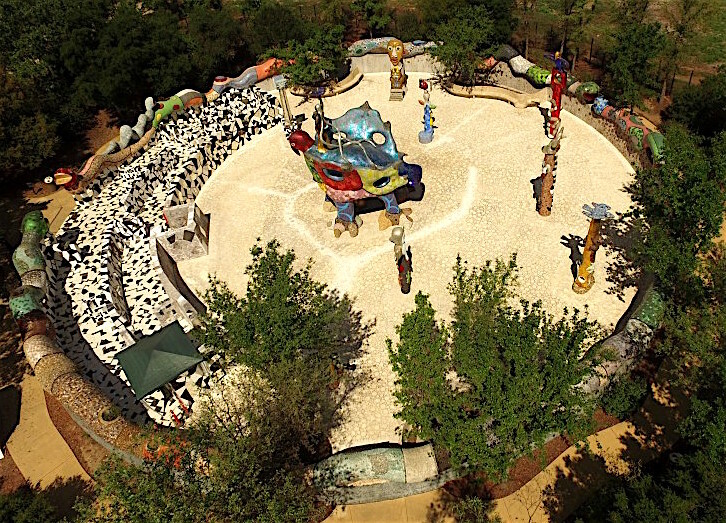 Beginning on Monday, August 9, Queen Califia’s Magical Circle in Kit Carson Park — 3333 Bear Valley Parkway — will be open to the public Tuesday through Friday from 9 a.m. until noon, weather permitting. Queen Califia’s Magical Circle will continue to be open on Second Saturdays from 9 a.m. until noon with docents on site to provide information and answer questions. “The City is excited to be able to add regular weekday hours for the community to explore and enjoy this unique and interactive sculpture garden.” said Jay Petrek, assistant city manager. Queen Califia’s Magical Circle is the only American sculpture garden and the last major international project created by French artist Niki de Saint Phalle (1930-2002). Inspired by California’s mythic, historic, and cultural roots, the garden consists of nine large-scale sculptures, a circular “snake wall” and maze entryway, sculpturally integrated bench seating and native shrubs and trees planted within the interior plaza and along the outer perimeter. The garden bears the brilliant, unique mosaic ornamentation that is an unmistakable part of de Saint Phalle’s later work. Niki de Saint Phalle’s last monumental work is nestled in a large park where families go walk their dogs, play Frisbee, bike, and have a Sunday picnic. At the end of a dirt path, in front of non-landscaped hill where wild grasses grow, unfolds a circular enclosure of about 50 yards in diameter surrounded by a seven-foot high wired fence. Behind this fence: the amazing enchanted garden of Queen Califia’s Magical Circle. 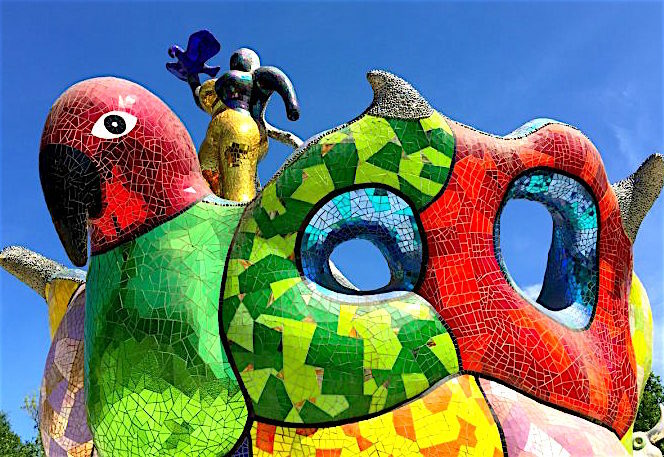 Niki de Saint Phalle moved to San Diego, California, for health reasons in 1994. Located 45 minutes north of San Diego and about 2 hours south of Los Angeles, the city of Escondido then offered her the possibility to create her one and only work in the United States. The project took over four years to take shape. Niki and her assistants work days in and days out but Saint Phalle passed away in 2002, one year before the inauguration. For this work, Niki de Saint Phalle found her inspiration in California’s myths and history and most specifically in the Califia legend, which became famous in the XVIth century and which gave its name to the State of California. According to the legend, Califia was said to be a black Amazon who ruled an idyllic island covered with gold. Behind the fence, a large circular wall, topped with undulating serpents, surrounds the garden. Beyond the only entryway, visitors discover a magical world where their history, their roots, and their origins can be reinvented. Inside, a small 5-foot high maze, lined with mosaics, large pieces of mirrors and black tile, leads us to the interior of this circular courtyard. And there, in the center, Queen Califia, powerful and feminine in her golden armor, mounting a gigantic eagle, dominates the courtyard. Visitors can sneak underneath the eagle and discover a ceiling incrusted with blue pieces of mirror and cosmic symbols. Under this starry sky, an egg shaped fountain (which did not work when we visited), symbolizes Califia’s magical powers over the oceans, but also birth, transformation and death, all recurring themes in the artist’s work. Surrounding Califia, stand eight totems measuring 11 to 20 feet high. Protective gods, animals with extraordinary powers, skulls, monsters and other symbols from Mexican folk culture, ornate the totems. Towering over them all, the eagle, his wings spread out, takes flight towards the sun. Each element of the garden is a mosaic made of numerous materials: multi-colored pieces of glass, pebbles, mirrors, shells, tiles, travertine, quartz, turquoise. Visitors of all ages can walk around, dream, touch, or watch their reflection in the mirrors. In this enchanted world, the best of their imagination is being solicited. Just like Niki had envisioned. The wired fence was not part of the project. The artist wanted the garden to be accessible to all, and all the time. But very quickly, many mosaic pieces were broken, which became a hazard for visitors. It was therefore decided to secure the access. The garden is currently undergoing a long and meticulous restoration. Opening hours have therefore been limited to the second Saturday of the month, from 10am to 2pm, and some Sundays. If you are on the road between San Diego and Los Angeles, the garden is definitely worth a detour! Warning: Make sure you check the opening dates on the website and don’t hesitate to call to get confirmation someone will be on site: when we visited, we had to wait a long time before someone was able to come over and let us in. (After a career in cinema and television in France and Brazil as a film editor, Dominique Haim settled in New York where she started a catering/restaurant business. 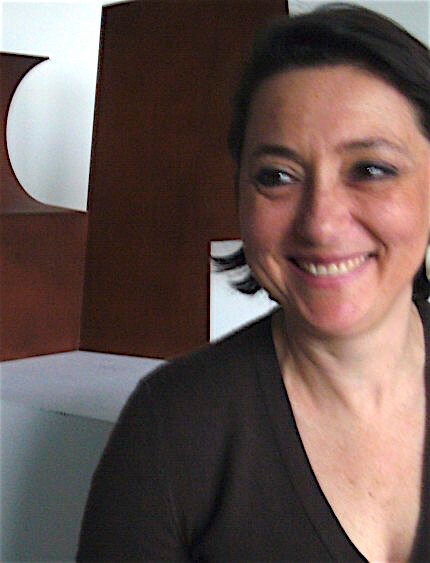 Fifteen years later, having grown up in the art world, she decided to open a gallery in Chelsea where she introduced to the American art scene European and South American artists such as Pierre Soulages, Matta, Oteiza, or Graciela Sacco. In 2006, Domique inherited a sculpture garden in the southwest of France. At the time, the garden already housed about fifty artworks by major 20th century artists, from Rodin to Calder, Maillol to Chillida, Miro to Niki de Saint Phalle. She decided to preserve this site and add to the collection with works by contemporary artists such as Andy Goldsworthy and Cristina Iglesias. Her curiosity for world cultures and her passion for sculpture parks, land art and public art lead her to create sculpturenature.com in 2014. Re-printed by permission. For more, visit http://www.sculpturenature.com/en/. Be the first to comment on "Visiting Queen Califia, Niki de Saint Phalle"
How dumb is Duncan Hunter? Don’t ask.